If you’re one of those who likes to take their laptop to Starbucks and spend hours working on projects, this will be very good news. Starbucks is now offering free Wi-Fi for all its customers. That means you no longer have to have a Starbucks card to log on. You no longer have to make a purchase to be granted access. You are no longer limited by time. 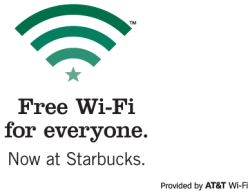 The unlimited, free, AT&T-provided connection is available at all of Starbucks’ company-owned stores in the U.S. In addition, participating Starbucks are partnering with Yahoo! to bring you the Starbucks Digital Network, with exclusive access to digital perks such as unlimited access to Zagat ratings; free access to subscription editions of USA Today, The Wall Street Journal and The New York Times; and exclusive free downloads from Starbucks Entertainment and the iTunes music store. Follow the jump to see a video promoting the new partnership. This entry was posted in Cities by John Plessel. Bookmark the permalink.